The New York Yankees bullpen has been its usual dominant self through the first 62 games of the 2018 season, and the resurgence of 6-foot-8 flamethrower Dellin Betances has played a huge role. As the Bombers opened up a two-game set with a 3-0 shutout over the visiting Nationals on Tuesday, Betances pitched his eighth straight scoreless appearance in relief, and his 20th of the year. Over those last eight outings, each one inning in length, Betances has dropped his ERA more than a full run, from 4.50 to 3.41. Opponents have managed a single hit over that span for a laughable .042 batting average, and the Yankees are 8-0 in those games. For a pitcher who many suspected might not have the mental fortitude to handle high-leverage, late-inning situations in his native City of New York, Betances has responded with as dominant a run over the last two weeks as fans have seen. Since May 27, when Betances' eight-game scoreless streak first began, the Yankees bullpen has posted a staggering 0.63 ERA, while allowing just one home run to opposing hitters. It has once again been a huge part of the team's recipe for success, as the Yankees sit on top of the MLB standings with the best winning percentage in the Majors (.694). 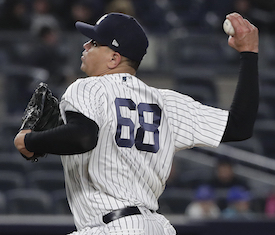 Earlier in the season, Betances said he's felt like his stuff is the best it's been throughout his whole career, and as manager Aaron Boone continues to trust in his gargantuan setup man, the results have matched the effort. One thing that has never been in question is Betances' strikeout numbers, which annually sit near the top of the heap among MLB relievers. In each of his four full MLB seasons (all of which have resulted in All-Star selections for the 30-year-old righty), Betances has finished top-seven in K/9 among relievers with at least 50 innings pitched. This year, his strikeout rate has gotten even better, as he's posted a career-best 15.8 K/9 mark through his first 27 appearances. His walks are down as well; 3.4 BB/9 would be his lowest mark since 2014. The only struggles Betances has had to overcome since his entry into the league has been his performances down the stretch, as fatigue and lack of command have been the main culprits of those issues. Looking only at his second-half performances over the years, Betances' ERA rises from 2.25 to 2.58, and peripheral stats show a similar dip in performance following the All-Star break. From April/March through August, Betances' monthly ERA ranges from 1.49 to 2.72, but when September arrives, that figure balloons up to a very un-Betances-like 4.27. Perhaps it's the double-edged sword of pitching well enough to earn your manager's continual trust that leads to more opportunities, and thus more opportunities to surrender runs as the year goes on, but there's no doubt that reversing that concerning trend is a major goal for Betances in 2018. Boone has demonstrated great caution in managing the workload of his entire team, including his bullpen, so maybe that will assist Betances in bucking the trend of the last two years as the summer months turn to autumn. "I've got to continue to believe in myself, and Boone's been running me back out there," Betances said earlier this year. "I feel good."